@GoneNomad, I think it was you that has been checking the ability of various solutions to find proper entrances to places with big parking lots (malls and similar) and get you to the proper location within the larger area. I was poking through a device that GPS City will have a Black Friday flash sale on in about an hour and a half from now (10am PST Nov 25) and stumbled across this piece of the manufacturer's description. The Direct Access feature simplifies navigating to select complex destinations, like airports and shopping malls, by finding a place within a larger location. When navigating to the mall, Direct Access gives additional location information for specific retail stores inside. For example, "Arriving at Woodfield Mall. Anthropologie is inside, on the upper level." Direct Access even navigates through parking lots to find the entrance nearest your destination." I know your focus was on the software/PC products, but I thought this was interesting that Garmin is making sure its map data supports this sort of thing. And appears to have supported it for awhile because the unit in question is not a brand new model. Apparently you are talking about a Garmin GPS? Did you get it? My most recent Garmin automotive devices are a Nuvi 3550 and Dezl 760 both of which date from ~2012. Have never seen this feature so it must be newer than 2012. It doesn't seem to be available on my Garmin StreetPilot app either. It's the Nuvi 2639LMT. Nope, didn't get it although the price was tempting. We have no travel plans for the foreseeable future. The main thing I want in a new one is the larger (6") screen. Other new features will be a pleasant bonus. After looking up the Nuvi modle you mentioned above, I noticed that it appears to be part of a fairly new series of "Advanced" Garmin PNDs, one of which also happens to be this RV-specific model: RV 770 LMT-S The "S" suffix apparently also means it's capable of linking to a Smartphone. It has a 7" 1024x600 res display, putting it into the range of an inexpensive Android tablet (most Garmin PNDs are 800 x 480 or lower). ...so I thought it might be worth it if it's available for a decent discount. But... NOPE! Lowest online price is the retail price. That's strike one. Then I read the reviews, e.g. : these. Yikes! Looks like Garmin has quite figured out how to actually implement some of the advertised features. That's strike two. And then I realized that being capable of linking to a Smartphone apparently still does not make it any easier to transfer trips planned with anything other than BaseCamp to it. I guess that's strike three. Gosh, I haven't done it in ages so I'm really stretching here. The simple answer is no. Sort of. If you mean plan a route with some other tool and load directly into the PND. However, Basecamp is free and it accepts interchange formats so you can use other tools as long as you can save into gpx or kml/kmz formats. Or a format that can be input to an online converter to get into one of those formats. IOW, it should be possible to export GPX from S&T (for example), import that into Basecamp, check the routing, and then download to the USB-connected Garmin PND? 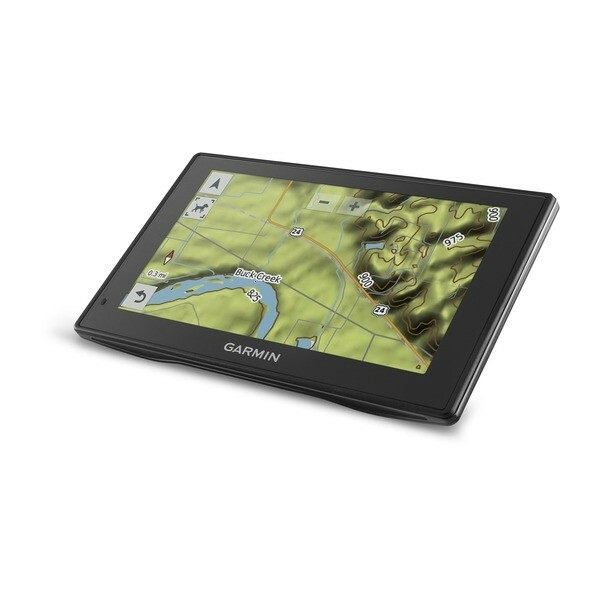 ...with the reasonable expectation that the Garmin PND will follow the same route as in BaseCamp. IOW, it's should be possible to export GPX from S&T (for example), import that into Basecamp, check the routing, and then download to the USB-connected Garmin PND? And then I realized that being capable of linking to a Smartphone apparently still does not make it any easier to transfer trips planned with anything other than BaseCamp to it. I still have my 5" Garmin Nuvi 3550 and 7" Dezl 760 but don't use them very much. The newer models don't seem very compelling to me, although the pricing on their automotive line is a lot more reasonable than their outdoor/handheld devices. There was a time when you could find some nice discounts on Garmin, but starting somewhere arount 2010 they have done a good job of keeping the third party price close to their suggested list. About the only way to save now is to look for factory refurbs at places like GPSCity. Thanks. I had come to the conclusion that the "S" suffix PNDs (the so-called "Smart" devices) don't use the smartphone link or the companion app to do anything I'm interested in. Also, apparently quite a few long-time Garmin PND users aren't too happy with newer models forcing them to use the Smartphone link to receive traffic data, compared to older Garmin models that received the traffic data directly (albeit supposedly less frequently and in less detail than with the smartphone link). From reading the comments in this review of the RV 770, it looks like the bluetooth audio output is only for phone calls, and can't be used for audio output of the directions, either. Not only that, I've seen a lot of users decribe a lot of flaws / poor design decisions in the software*, so that, and all the other limitations of a relatively closed PND-based system, at a still-too-high price tag, made me decide to pass. *e.g. : the RV 770 has grade warnings, but it does not audibly announce them; all you get is a beep for those and many other warnings. 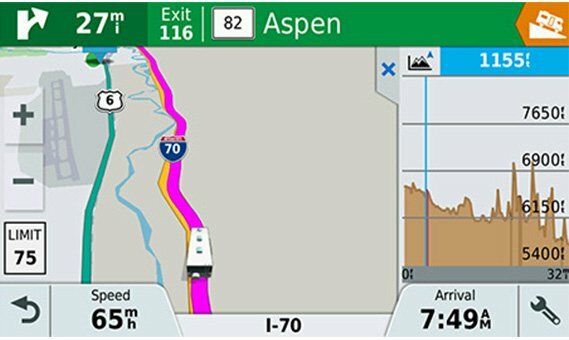 Features like this are unique to these Garmin RV/Truck models, but aren't very useful if that info isn't conveyed to the driver far more readily than just a beep that tempts the driver to take his eyes off the road just as he's about to enter a challenging section of road. When I read this, I remembered I had already looked into this unit about a year ago, and decided it wasn't worth it (wouldn't be surprised if I'd posted that on here at the time). Still isn't worth it, for me. For me, using S&T for trip planning and Win10Maps for the actual navigation seems to be the best combination. ...especially since my 3 LTE tablet is a good hardware match for this task (in my situation), and in areas with LTE service, also allows direct access to DOT cameras that show actual road conditions, something no Garmin PND will do. The traditional PND brands are really missing the boat by not including that functionalty, although a few have tried to put their "full-blown" software on an Android tablet, they never seem to get it right (either intentionally making it too limited like Street Pilot, or too buggy like RanD McNally). While I like the idea of a dedicated RV mode, from the cursory testing I've done, CoPilot's RV mode isn't all that it should be (what a surprise, eh?) and most of what it does do can be accomplished in S&T simply by adjusting the average speed downward. Since my trailer is less than 10-ft. tall (no overhead A/C units either), overpass clearance is practically never an issue on the roads I drive on, but if it was, I'm pretty sure the signage will warn me. I think the "S" is to distinguish the type of traffic service - IIRC.. I'm a mod at gpsreview.net and the consensus is that the smartphone link traffic is a huge improvement over the old RDS/TMC FM traffic and also better than the newer HD traffic. I think the smartlink traffic is the same as what I get in the Garmin StreetPilot app, I think it's from HERE. And it has been very good in my experience, you can see things change in realtime as you drive through a congested area like NYC. I had several old models with the FM traffic receivers and they were all but useless here in the NorthEast. I gather the service may be better on the West coast, and in the EU people have always been pretty happy with it. But in my area it was terrible, it used such a low bandwidth, antiquated system that it couldn't report that many incidents and they were only in your local area. But the biggest problem was there are so many places where you get no signal at all. I had a 50 mile commute to Philadelphia for a number of years, and I couldn't and traffic data until I was 20 miles from town, which was too late to choose the best detour. Going up the NJ Turnpike there were many "dark zones" with no traffic data. Yeah, I wouldn't doubt that the newer Smartlink's much more frequent update interval and greater detail would be better for reporting the type of traffic problems most people are concerned about (accidents bringing traffic on a major thoroughfare to a standstill). My long distance travel scheme is mainly just to time the trip start and meal stops to avoid big-city rush-hour traffic entirely. I just stumbled across this device while looking for something else, and am just amazed I've never heard of it even though it was introduced in 2016. Now it is intended to be used with their dog tracking systems via a bluetooth link, but I think you can just turn that off. And what you get is a device very similar to their standard 7" DriveSmart 70 with an included 100k Topo map. But the really surprising thing is that it's compatible with Garmin's BirdsEye aerial imagery and includes a one year subscription. The only other automotive devices with this capability are the really expensive Zumo series, and they only have a 5" screen. From the website, they imply it is more compatible with topo maps than their other automotive devices, but I haven't seen enough screenshots to really tell. Anyway, this is a very interesting product that they just have not promoted for anything but dog tracking. When you consider that the topo and Birdseye sell separately for $110, the $400 pricetag isn't too bad (in Garmin's universe at least). That looks quite interesting. USD$400 converts to CAD$515 at today's exchange rate. The only Canadian source I can find for it is Amazon.ca but they want CAD$650 for it!! My usual Canadian sources for Garmin products show it as "discontinued". OK, at first I thought the advantage to this system may be that it could use an external GPS receiver (because it's designed to work with GPS dog collars), but after quickly skimming over the product info, now I'm not sure about that. So Boyd, in a nutshell, what is the advantage to this compared to a road-oriented Garmin PND in a similar price range...? Is it the included 100k Topo map? ...that's not available for (or very costly) for something like a Garmin RV 760 or 770? The 100k topo map has not been very good in the past, I have had at least three different versions. However, a few years ago they switched to HERE as the provider for road data and that is supposed to be a big improvement. The old version was based on the legacy US Census Bureau TIGER road data that was notoriously inaccurate. But the nice thing about this map is that you get coverage of the whole US and it also has 3d terrain (DEM data). So, for someone who wants a basic topo map, this is a $80 perk. I suppose you could use one of those dog collars if you wanted an "external GPS" but that wouldn't make any sense, and you would also need an Astro because this DriveTrack can't directly receive their signals. They don't have another Birdseye-compatible 7" device. The Zumo 595 supports it but costs $700 and only has a 5" screen. The GPSMap 276cx also supports it but also costs $700 and only has a 5" screen. That makes the $400 pricetag on this device attractive (if someone wants this kind of thing). And of course it also has all the features of the DriveSmart 70 automotive device. Garmin's RV and Truck devices are not compatible with satellite imagery. So I'm surprised Garmin has not marketed this for things other than dog tracking. I have seen many threads on other sites where people wanted large screen devices for off-road use. Knowing the way they like to protect their markets, this might be intentional. I'm sure they would rather sell you a $700 GPS instead of a $400 model. • Cannot find shopping malls in Microsoft Streets and Trips! • Getting Streets & Trips to keep things "squared"